In Line Six are (from left-to-right) Teddy Fury, drums/vocals; Steve Good, bass/backing vocals; Danny Bartley, guitar/vocals. Fury and Good are longtime eastenders. Photo by Wally Hucker. The In Line Six rockabilly trio will be playing their home turf, returning to Salty Dog Bar and Grill, on Sunday, Feb. 10. Two members of the band are longtime east end residents. Drummer and lead vocalist Teddy Fury has lived in the eastern end of Leslieville for more than two decades. Fury, like Good and lead singer/guitarist Danny Bartley, also plays with other rockabilly groups. 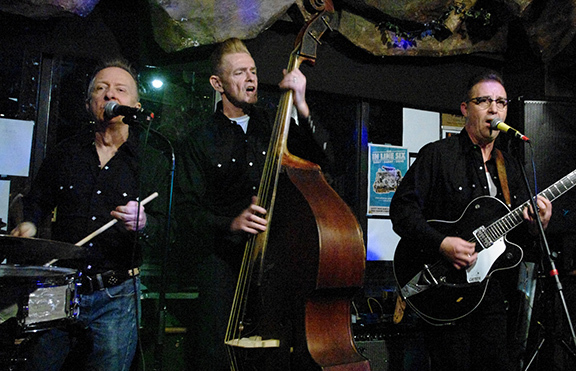 Although the trio disdains the term super group, they have founded and perform with other top Canadian rockabilly groups. Fury and Bartley co-founded The Royal Crowns. Good founded Greasemarks, who recorded their self-titled album in Los Angeles last spring. Both groups have toured Canada and the United States. The In Line Six packed Salty Dog in their world debut in November. “What a pleasant surprise to catch these guys locally,” says Tony Oldland, host of TonyO’s Variety Jam Night at Salty Dog. The In Line Six show at the Salty Dog, 1980 Queen St. E., on Feb. 10 goes from 3 to 6 p.m.